← Have you caught up with all the hype on GDPR? Calculating Tax need not be taxing in your Microsoft Dynamics 365 environment. Supporting multiple tax rates, MyTaxCalculation offers extended functionality and configuration to enable accurate tax amounts to be calculated on products with or without freight and discounts. 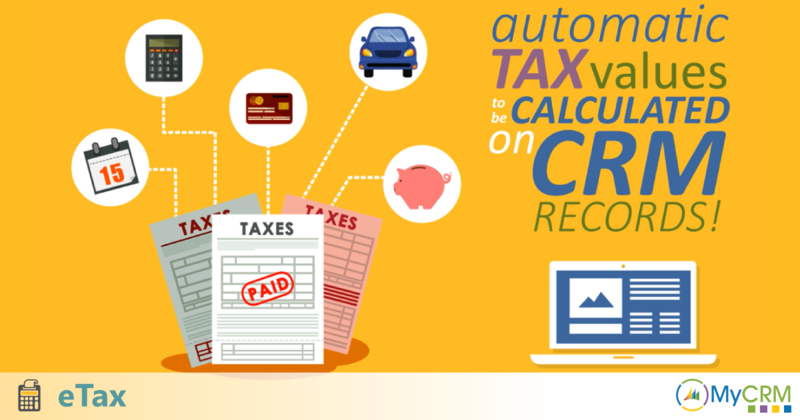 MyTaxCalculation is a productivity enhancement to the way Opportunity, Quote, Order and Invoice calculates sales tax or VAT. This allows an end user to select a VAT or Tax Rate for the particular Opportunity, Quote, Order or Invoice record as it is being created. With this solution the only change to the Opportunity, Quote, Order or Invoice screen is the addition of a look up field for the appropriate VAT or Tax Rate. Each product line record also has the feature to override a parent tax rate or become NILL of tax. MyTaxCalculation will require some setup of products, tax rates and initial configuration settings which is full documented below on our Download Centre. Note all MyCRM Productivity Enhancement are now available on subscription.